Edge of Darkness is a compelling BBC drama series which revolves around the life of Detective Ronald Craven, who loses his beloved daughter, Emma, in episode one. After seeing her horrifically gunned down, Craven begins a hunt for her killer. Mystery surrounds her death; was the shot really meant for Craven or was it something more sinister? Each episode is full of suspense and drama and, as the viewer, we are always kept wondering what is going on and what will happen next. As Craven digs deeper the plot thickens and he finds himself dealing with conspiracy theories, politicians, Scotland Yard and even the CIA. There are two discs, that each contain three episodes, making up series one. I found the episodes on disc two more enjoyable because there were more twists and turns and the plot really unfolded nicely. The episodes on disc one are really introducing us to all the characters and telling us what their involvement in the plot will be, which sometimes becomes confusing. The series stars Bob Peck as Craven and Joanne Whalley as his daughter, both doing a fantastic job. The writers have incorporated the deceased Emma into the storyline very effectively, making out as if Craven is haunted, and helped, by her ghost. This is a go, go, go series. The episodes all carry on from one another and are each as in depth and suspenseful as the last. I love British drama series'. They really make you think about the script and the characters and you can really get involved with them and try and solve the crimes yourself. This is a great series. Usually, I'm not a huge fan of anything political but the writers manage to get past, what can sometimes be confusing with politics, and deliver a fast, witty and intriguing story. 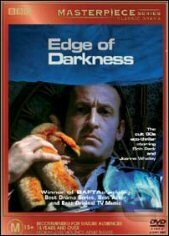 It is no great surprise that 'The Edge Of Darkness' won as many awards as it did. Whether it be an emotional scene or an intense scene, the actors all do a brilliant job. This series was made in the 1980's so dont expect it to be as high tech and digitally enhanced as a movie of today. But considering it was made in the 80's the picture quality is quite clear. The music throughout each episode really helps to convey different levels of intensity, the score was composed by Eric Clapton. At times the sound quality is not fantastic, it is sometimes difficult to differentiate between background sounds and character sounds. The special features on both discs are good. Disc one features talk back interviews with critics about the first half of the series, an interview with Bob Peck, the television critics awards and segments from the BAFTAs (British Academy of Film and Television Awards), where the series won Best Drama Series, Best Actor and Best Original TV Music. Disc two features an alternative ending for the sixth and final episode in the series, a photo gallery and comments from the writers and cast.